When the mid-level djinni Bartimaeus is called into service by a 12-year-old apprentice magician, he can’t help but be shocked. A magician this young has no business calling even an imp on his own, much less a 5,000-year-old djinni who has served the likes of Ptolemy and Solomon. But the young magician, Nathaniel, seems to know what he’s doing, and he gives his order in such a way that Bartimaeus has no choice but to obey. The order? To steal the Amulet of Samarkand from the magician Simon Lovelace and hide it in the study of Nathaniel’s master. The request is simple enough, but the consequences are not. Lovelace is a skilled magician with secrets of his own, and before long Nathaniel and Bartimaeus are caught in a complex web of spells and deceptions. They have no choice but to operate as partners of a sort. Nathaniel needs Bartimaeus’s power, and Bartimaeus needs Nathaniel to stay free of eternal imprisonment. The Amulet of Samarkand by Jonathan Stroud is the first in a trilogy (soon to become a quadrilogy). It’s a sort of YA Jonathan Strange and Mr. Norrell, but with djinn instead of faeries, and with part of the story told from the faery’s (djinni’s) point of view. The series is set in an alternate version of London where magicians are in charge and where history is rather different from our own, but still familiar. One of history’s greatest magicians was Gladstone, former Prime Minister, whose magical prowess helped him rise above all the other magicians in Parliament. Bartimaeus’s chapters alternate with chapters about Nathaniel, whose story is told by a third-person narrator. Nathaniel is a brilliant kid but he is a kid—and an immature one who needs guidance from a sensible, caring adult. He can say spells, and he loves the power, but he does not know what he’s getting into most of the time. I really want to know what sort of person he’ll develop into because, honestly, he could go either way. In the audiobook, Simon Jones reads both sections, but it’s always clear whether a given chapter is a Bartimaeus section or a Nathaniel section. 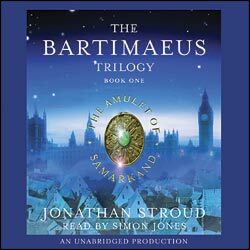 Stroud gives each of his narrators a distinct voice and storytelling style, and both are equally compelling, although Bartimaeus is certainly more fun to listen to. Just as in Jonathan Strange and Mr. Norrell, neither principal character is completely admirable, but you can’t help but root for them, especially when you meet the almost entirely loathsome people around them. One of the cleverest aspects of the way the story is constructed is how Stroud gets these two to become allies so that the reader can want them both to succeed, even if they are, in some respects, enemies. The story barrels along at a nice pace and is filled with clever set pieces, my favorite being the Mournful Orb used in interrogations of magical beings at the Tower of London. So, so creepy, and the source of some cringe-inducing tension for me, the listener. Even though it’s part of a trilogy, the main storyline is resolved when the novel closes, but there’s a larger storyline in the background. It’s like the Harry Potter books in that way. The big, overarching story is still unfolding, but the adventure that drove the plot of this book ended when the book ended. But the overarching story has lots of potential, and I’m eager to see what happens in the next book, The Golem’s Eye. 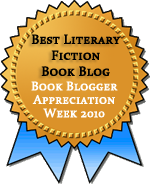 This entry was posted in Audiobooks, Children's / YA Lit, Fiction, Speculative Fiction. Bookmark the permalink. This book came up for voting in the mother-daughter book club that I belong to, but it got voted out. Reading your take on it here, I feel that I should get my daughter to pitch it once again :). Hema: This is a great book for adults and kids, so I can imagine it would go over well in a mother/daughter book club, provided that the participants like fantasy. And do feel free to add us to your blogroll. I intend to check out your blog right away! I read this a long, long, long time ago and really truly loved it. I’m glad it’s getting some blogger love. Lena: I’m not sure I’ve seen any blog posts about it; I only found out about it through my family. Maybe the release of the new book later this year will increase its profile in the blogosphere. What Iena said. The whole trilogy is marvellous, and I’m delighted to learn there’s a fourth book in the works. Unlike Harry Potter, Nathaniel moves on from apprentice status, and his moral ambivalence deepens, but he stays a great character. Jonathan: I’m really interested in seeing how Nathaniel develops. I’ve gotten a few chapters into The Golem’s Eye now, and he really could go either way. I’m so glad you enjoyed this, I shall be promoting the books to nearer the top of my TBRsoon pile. I’m also very glad that they’re closer to J.Strange & Mr.Norrell than HP… I hope the other volumes are as good. Annabel: Yes, it’s much closer to JS & Mr N than to HP, both in setting and style. I think you’d like it. I’ve had this book for a while now, and am very glad to read this positive review. It means i might get around to it sooner rather than later! Litlove: This is definitely worth giving a try next time you’re in the mood for fantasy. It’s very cleverly done.